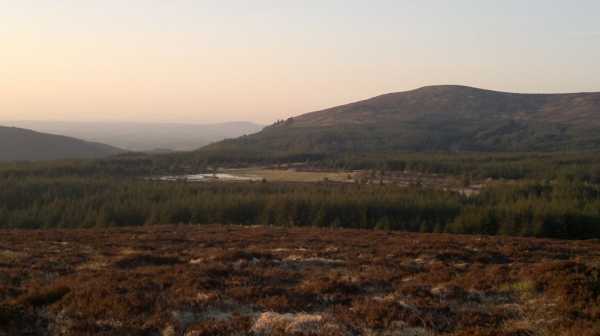 Slievemeel is situated midway along a ridge of upland that starts with Slievemeen above Carlingford Lough to the south, and which leads eventually to Shanlieve and Eagle Mountain to the north. 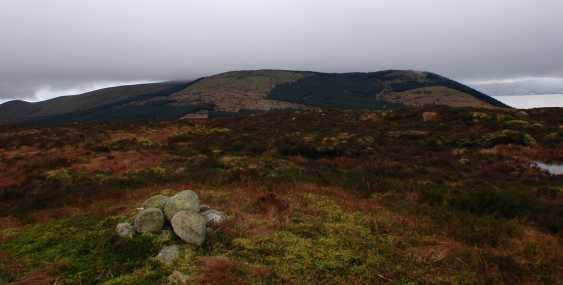 It is a part of the 400 metre group of hills known as Rosstrevor Mountains, and the lower slopes of these hills are extensively forested. Slievemeel has some nice views of the higher mountains to the north, as well as such small hills as Tievedockeragh, Gruggandoo and Crenville. There some good views along Carlingford Lough and over some of the coastal villages such as Rostrevor. Slievemeel can be reached from the carpark at J196 174 A. At about 250 metres altitude it takes some of the effort out of the walk. Follow forest tracks north about 3kms to J205 200 B. Climb the fence to handrail a forest edge upwards for about 1km before turning east to reach the boggy summit about 150 metres away. Having bagged Slievecarnane and Crotlieve as a warm-up earlier in the day, I decided on a main course of a circuit of Slievemeen, Slievemartin, Crenville and Sleivemeel. The advise from other posters on the challenges of Crenville weren't ignored and a little online research for Kilbroney Park revealed a far better and more uptodate map with all its bike tracks than my 15 year old Sheet 29 OS Map. I should preface my comments by saying that I did this walk mid-week in early September and met only one mountain biker on the stretches of bike track that I used. I would not recommend trying to use the bike tracks at weekends when they would likely be far busier and hazardous to walkers. The circuit started at the upper carpark at J196173 F, taking the good walking tracks past Cloghmore and into the gap between Slievemeen and Slievemartin, climbing the former first and then backtracking to head to the latter. That was the easy part of the walk and the going gets much more difficult from here. Although the south side of Crenville didn't look all that bad from the slopes of Slievemartin, I wasn't about to ignore the warnings of tussocky, boggy ground offered by others. At this point I descended to the Red/Black bike track heading north around the slopes of Slievedermot and ascended Crenville from a point after where the Red and Black tracks split at approximately J208191 G. There is a section of board walk through the forest and after this the northern slopes of Crenville open out to reveal clear access to the summit. 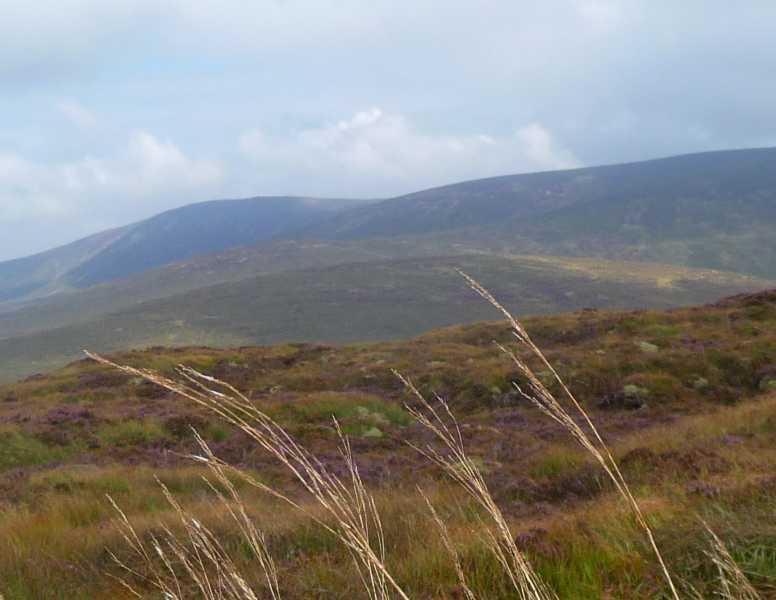 The underfoot conditions are difficult with holes and tussocks and long grass all the way. I can't compare with the southern side, but if that's worse then it should really be avoided. To get from Crenville to Slievemeel is where I went wrong. I went back to the Red track and continued (east). Cycle tracks, unlike walking tracks are made unnecessarily long by adding meanders at every available opportunity and the walk around to the southern slopes of Slievemeel took about 75 minutes, almost all of it through dense, dull forest. Picture from csd : The view south towards Crenville and Rostrevor. Picture: The view south towards Crenville and Rostrevor. a fence to cross before the forestry track. Beware!, the fence is close to a small stream/ditch in a couple of places, which you can not see due to the vegetation. So, be wary stepping over it, as there may be more of a step down than it looks.